After just over two weeks of the laziest and most relaxing Mediterranean summer holiday, with a total abstinence from every form of electronic communication and digital devices, I do feel a bit out of practice as I sit down at the little table on our balcony to share some memories (and a recipe) of my summer vacation with you, an old (ancient!) laptop before me (when have I last used this thing?! ), a glass of chilled blanc de noir next to it, and the last hours of sunlight (and the last 40% of battery) ticking away. Let me tell you: these last weeks were the most recreative and decelerating summer holiday I can remember. As in: in my whole life. And, after checking facts with my mom: it was indeed the longest holiday I have taken since 1987 (that’s nine-teen-eighty-seven for you. The Berlin wall was still standing when I last had a holiday of more than two weeks). As Alex and I are both the busy-bee-type, we intended this holiday to be absolutely laid-back: No frantic running from church to church (to museum to ruin to …), no endless roadtrips, no tightly knit holiday schedule (an oxymoron in my book anyway) – just a simple formula: one island (Mallorca in the Balearic Islands archipelago), one sunroof, the sea, the sun, good & simple food (and a drink or two) and a lot of time together. Yawn if you want – we had a blast! Okay, we didn’t just lounge around for the whole two weeks. Pretty much – but not entirely (you gotta eat!). 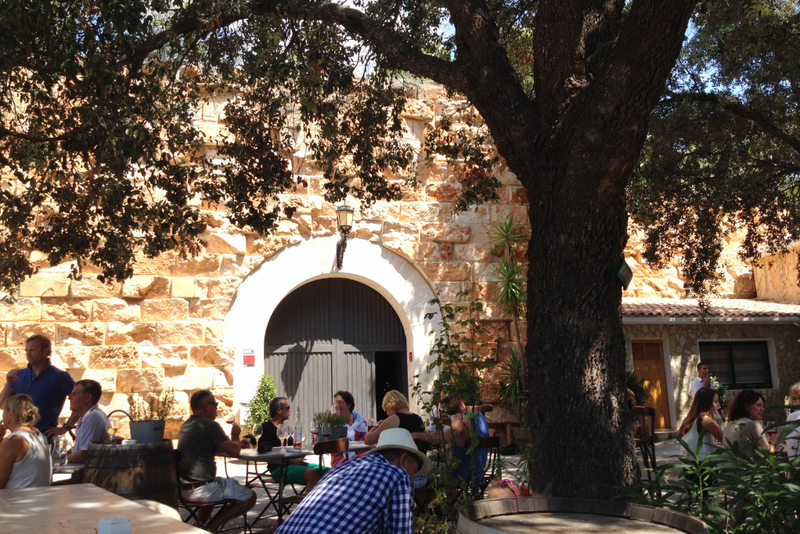 We took one little trip to a nearby winery (think: tapas and chilled white under a tree in the middle of the vineyards) and one to the salines of Es Trenc (if you get the opportunity: DO try their ‘rosa’ salt with rose petals and szechuan pepper), plus one to the capital Palma (why I love my husband: after a gluttonous meal of fried boquerones, stockfish croquettes, stewed sepia mallorquin with bell pepper, raisins and pine nuts, a plate of baked Sobrasada sausage, flash-fried lamb’s liver with potatoes, and an abundance of albondigas (Spanish meatballs with a touch of cinnamon) – for just the two of us – he asks if we share a pudding). Apart from these little ventures, we just enjoyed the good life at our little casita, where most of our trips took us to the kitchen, where we assembled simple easygoing, fresh summer dishes: while we would make use of our situation near the sea and prepare seafood dinners-for-two in the evenings (like a garlic baked moist and flaky turbot with roasted vegetables), for lunchtime we almost always kept it cool: gazpacho and some ham and cheese, or a quickly assembled salad of poached pulpo with roasted bell peppers, parsley, tomato and cucumber, or as in the case of the recipe I give you below, with wonderful doughnut peaches, goats cheese, onions, basil and pink peppercorns. Do try it on its own as long as the season lasts, or pair it with some BBQ – it makes a great addition to some grilled pork, for example. It’s a cinch to make and everything that summer is about: fresh, vibrant, light, aromatic. Mostly, we did what we barely get to do when we’re in the frenzy of our normal working life at home: read. Equipped with my little battery of food writing volumes, I got around quite a bit in the fortnight of our stay, even while spending most of the time in one geographical place: I took a veritable journey of the world and through time, all along the lines of food, cooking, and eating. Together with the authors behind and the hero(ine)s inside the pages, I discovered 1920s Paris and craved duck liver with figs and port, I sneaked into 1970s Chinese street kitchens and found out what to do with the fried pig’s skin that lurks around in my kitchen cupboard, I witnessed the raging heat and smoke in an Elizabethen London kitchen, and dined in upscale restaurants in New York, Chicago and Berkley, just to find myself back in the Bronze Age the next moment, asking myself whether I should invent a pot. I love food writing which is educational while being entertaining, sensuous and witty. I found all the following four books to cater to my needs – and I’m happy to recommend them to you. Adam Gopnik’s The Table Comes First offers a wonderful and personal (slash American) history of good eating, fine dining and the restaurant and an exploration of the meaning of food in our lives, starting where it all began: in 18th century Paris, when the first “restaurant” (an institution named after the healthy broth which was the only thing sold at a restaurant in the beginning) opened its doors on the Rue Saint-Honoré. Gopnik unravels the ideological debates and cultural quarrels surrounding the idea of eating well from classic gastrosophes like Brillat-Savarin and Grimod de La Reynière to the modern debate on whether and how to eat animals. His narrative is interspersed with fictional emails to Elizabeth Pennell, a 19th century female food writer and author of Diary of a Greedy Woman, with whom he shares recipes showcasing his favorite ingredients (anchovies! bacon! saffron! cinnamon! salt! mustard!) and about whom he makes a bittersweet discovery in the final chapters of the book. Bee Wilson’s Consider The Fork was so much fun to read. She takes on an unusual perspective and explores the history of how we cook and eat by considering the tools we use to tame fire and ice and feed ourselves. From the deceptively humble and seemingly unsophisticated wooden spoon to the latest fancy kitchen equipment, Bee Wilson follows them from the bronze age to the future and writes with lots of detail and wit (If you’re a sceptic of the cup measuring system, you will just love to read her rant about it). While delivering an engaging narrative, Bee Wilson also shares a lot of useful kitchen knowledge about everything from knives to pickling and thermodynamics. Monique Truong’s The Book Of Salt is a very sensual story about Binh, a young Vietnamese chef who takes on the position of private chef in the household of Getrude Stein and Alice B. Toklas in 1920s Paris. I loved how Truong combined historical information about Stein and Hoskins and wove it together with the touching life story of her main character. Through Binh’s eyes (and all his senses, really), Truong lets you revel in the rich and luxurious food at ‘mes mesdames’ household (my favorite recipe in the whole book reads like this: “24 figs, so ripe that their skins are split. A bottle of port wine. One duck. 12 hours.” – I’ll definitely try that) and lets you feel the joy, love, sorrow and hope Binh has gone through in the various kitchens he has occupied in his life. One of those books which doubles in size due to the many dog’s ears you’ll need to mark great sentences like “A cook who has no desire to eat is a lost soul”. Ruth Reichl is a staple on my night stand. I love her self-ironical writing and her unrivaled way of needing just a few words to make you see, hear, feel and desire whatever she is eating or cooking (you should follow her on twitter if you’re not already doing so – 140 characters and you’re somewhere, but not here). Comfort Me With Apples is another one of her autobiographical books, set in the 1970s when Reichl first became a food critic. She gives a vivid and intimate account of a career full of great tastes and experiences, of a woman spoiled and challenged by love and life (and she sneaks in a few great recipes, some of which are now on my to-do list). Particularly amusing are the recurring scenes in which Ruth meets now famous people from the food world for the first time, and gives you a glimpse at their humble (or already over-the-top) beginnings. When Ruth Reichl tells a story, you don’t have to go on philosophically about how food is life and how the two are inextricably intertwined – you just feel it. Cut the onion on quarter-rings, put it in a colander and rinse under cold water just quickly, to reduce the bite. 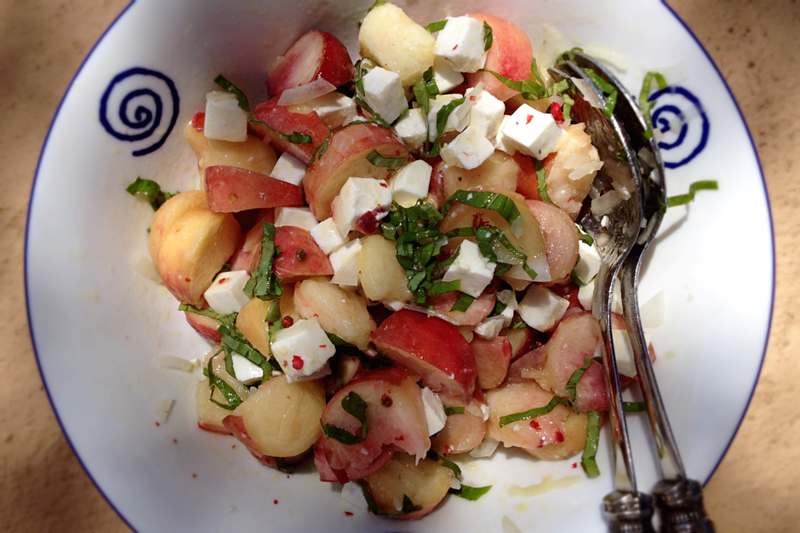 Cut the peaches into chunks and the queso fresco into cubes, tumble both together with the onions. Cut the basil into fine strips, crush the pink peppercorns with your fingers and sprinkle both on top of the salad, then add salt, pepper, lemon and balsamic to taste.